Who wants a free Greenhouse Gala Craft Tote? All new demos who order their Starter Kit during this special promotion period will all receive a gorgeous FREE craft tote (valued at $49.95)! Did you know you can live anywhere in Canada and still be part of my team? Absolutely! I support demonstrators all across the country, from Vancouver, BC to Fredericton, NB and points in between! Whether you are looking for a great discount or maybe you want to make Stampin' Up a successful home business for you, I'd love to have you as part of my team! For the first TEN people that sign up with me in the month of September, I have an additional stamp set gift for you... contact me for more details! So if you would like more information about what's included in either of our 2 Starter Kits or about the perks of becoming a demonstrator, please let me know! 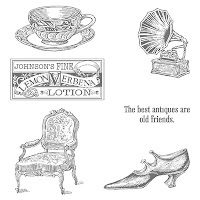 The best antiques are old friends! I actually took some time today to do some stamping that was NOT for a class, NOT for an online project, NOT for a team meeting, swap, tutorial or anything else work related - strictly something made out of love to give to my bestest friend. So Christyne, off you go now.... no peeking! I didn't buy Timeless Treasures myself but instead received it with a bunch of other new ones from Stampin' Up as part of my 2010 awards -- yay, who doesn't like free stamps??!!! Since this set was out of my usual style, I was a little hesitant about using it. Then I was inspired by a card I saw by Heidi Saks on SplitCoastStampers recently and the cup idea stayed in my mind. I think the use of our new 1/2 Inch Crochet Trim Chantilly paired with the "Deck the Halls" Holiday mini DSP and vintage-looking Antique brads turned out really nice. I also added some extra texture by using the Square Lattice embossing folder on the Cherry Cobbler cardstock. Great new deals in the CLEARANCE RACK! 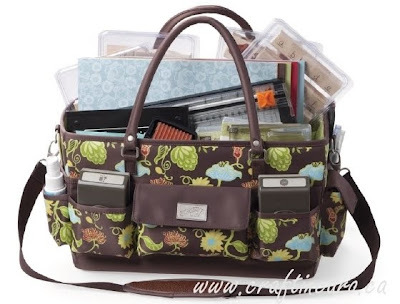 Yup, just noticed a bunch of great new items being offered on the Clearance Rack of Stampin' Up! 's online store... be sure to avoid disappointment and grab these before they run out! It's BIRTHDAY CARD CONTEST time again! 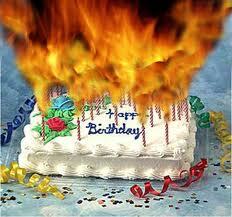 My birthday is just a few short weeks away, so I'm once again holding a BIRTHDAY CARD CONTEST for my blog readers! How old will I be on September 13, you might ask? Well, I'm thinking that 39 + S&H is a good answer to give... what do you think?! Send me a card wishing me a happy birthday and I'll put you in a draw to win your very own Level 2 Hostess set, Cute By the Inch! 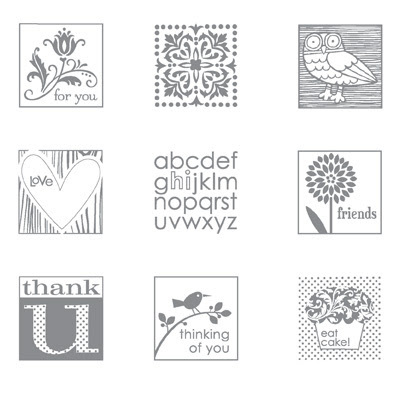 This variety of fun square-inch graphics provides great options for decorating mini messages. Pair this set with our brand new Petal Card punch, which scores mini envelope flaps as it punches, and all you have to do is stamp, punch, and fold, and you’re on your way to sending some seriously cool salutations. Plus, the images in this set work great for creating all kinds of accents for your projects. I fly out for my 2010 Founders Circle incentive trip on Tuesday the 14th, so I'll be holding the draw Monday afternoon after the mail has been delivered, and posting the winners name HERE on my blog. Here's one more card sample for you from my Sympathy/Thinking of You cards class. I had someone ask me to "please use the tree stamp in the Thoughts & Prayers stamp set" so of course I had to oblige! I chose a colour palette from the Neutrals family: Very Vanilla, Soft Suede and Early Espresso, with an accent of gold from the new Champagne Glass. If you don't recognize the name, that's okay... it's something new that comes out September 1 in the new Holiday Mini catalogue. I just applied it to the card as a final step using out 2-way glue pen to stick it on. I used the Scallop Trim Corner Punch on the 4 corners of both the Very Vanilla and Soft Suede cardstock layers, as I really liked how it turned out layered together. On Monday, I'll be sending out to my newsletter subscribers the instructions for a new project using the new Day of Gratitude stamp set from the upcoming Holiday Mini Catalogue. This new colour combination is a great one for autumn, using Cajun Craze, Early Espresso and Old Olive. By the way, if you aren't receiving my weekly newsletters -- why not? It's FREE and you can sign up right HERE to get yours sent out every Monday. This project was shared with us by Stampin' Up! in our monthly demonstrator magazine, Stampin' Success. I love flipping through it as soon as it arrives in the mail and seeing the gorgeous new cards and reading the cool articles they publish -- I'm always hugely inspired! Here's a simple but pretty "From the Heart" card using Watercolor Trio, one of my favourite sets from theSummer Mini catalogue. I used the same colour combo as for yesterday's Elizabeth card - Blushing Bride, Pear Pizzazz and Rose Red, but this time the Rose Red is more predominant and not just an accent colour. I rolled the jumbo wheel Very Vintage over the background so it would give a subtle pattern to the cardstock. As for the sentiment, I stamped it in Rose Red on an oval punch out of Blushing Bride. I had already punched out the centre from the larger decorative punch shape of Pear Pizzazz, and sandwiched it together using Stampin' Dimensionals for a bit of a Shadow-box effect. The flowers and leaves were inked with markers, and I used my bling-bling Rhinestone Jewels to accent them. All in all, this is a fairly simple card to execute but you know it will be received with love...you made it for them after all! Today's card features a new fave stamp of mine called "Elizabeth". It's another one of Stampin' Up! 's single stamps, and the elegance of its lines caught my eye right away. Because the oval centre is blank, you can customize your card with whatever sentiment you want. Since this is a sample from my upcoming Sympathy Card class I chose the words "so sorry" from Fundamental Phrases. My colour combo today was Blushing Bride, Pear Pizzazz and Rose Red. 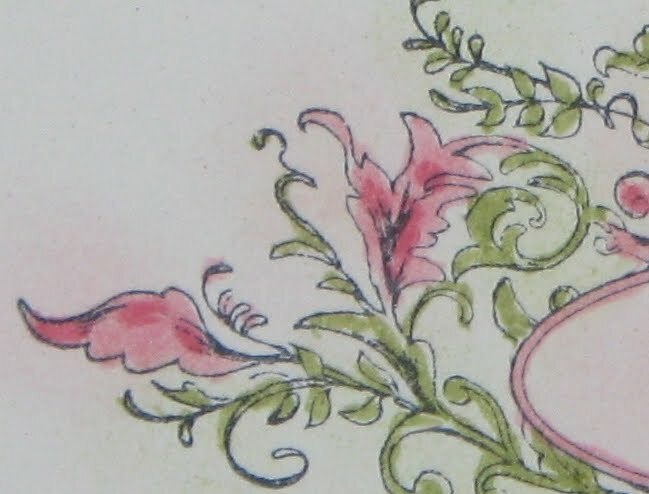 The image was stamped on Shimmer White, coloured in with markers and then I softly sponged in some Certainly Celery & Pink Pirouette with my sponge daubers to fill it out a bit. I also used the Vintage Wallpaper Textured Impressions embossing folder on our cardstock weight vellum and adhered it to the front of the folded Pear Pizzazz base. So, how do you like it? I'd love to hear from you! A whole lot of excitement, too early in the morning! Well, it's been one heck of a day, and it's not even 10am yet! It all started in the middle of the night when we were awakened with crazy banging and pounding at our front door. 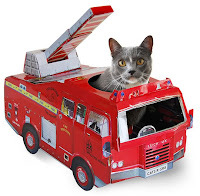 After a peek out the window & catching the flashing of emergency lights, we opened the door just to have a fireman tell us we needed to evacuate... and NOW! We threw some clothes on, grabbed the kids and headed outside in the dark -- where there ended up with 18 units attending the fire! It turns out that 2 doors over was billowing massive amounts of plastic-y smelling smoke so out we went. Luckily, the 2 alarm fire ended up with no injuries and we were sure happy to finally be cleared to go home after spending the early morning in our local Country Style donut shop. Moving on to today's sample, here's a card for my upcoming Sympathy/Thinking of You cards class. Featured is the "Because I Care" set, one of our gorgeous hostess offerings from this year's catalogue. While this set is not available for sale, you can get it FREE for either placing a $200 order or by joining my Stampers Club beginning in September. Ask for details... I'd be happy to tell you more! Because of the detailing on the main floral image, I used 2 of the In Color Markers: Pear Pizzazz and Concord Crush. Markers make it so easy to deal with the intricacies of those trickier images, and I can't imagine not having these yummy new flavours... oh, I mean colours, to play with. As an FYI, I have now added a second date so if you can not make it to Saturday's 1pm time, you are welcome to stop in on Monday the 28th's class. Time for a TAFFETA ribbon share! After the fabulous success of our recent In Color Ribbon share, I heard from a lot of you wanting MORE MORE MORE of these offerings. Who am I to say no to my awesome customers??? Our next ribbon share is for the wonderful 3/8" Taffeta ribbon, where you get 2 yards of each of the 13 colours available: Whisper White, Very Vanilla, Daffodil Delight, Pumpkin Pie, Pretty in Pink, Real Red, Rich Razzleberry, Night of Navy, Marina Mist, Certainly Celery, Old Olive, Early Espresso and Basic Black. That comes to $29.95 (which includes the S&H and HST costs to Stampin' Up!) for the 26 yard package share. You can participate in this share by emailing me directly for payment options. Here we are with some more Baby & Kids cards for this week's class on Wednesday. The first of these cards is a perfect card for a little boy. They do so love their trucks, don't they? If you don't recognize it, it's from the Loads of Love set, which has a new companion piece called Loads of Fun! Colour combo today was Baja Breeze, Early Espresso and Pear Pizzazz. The cupcake in the back is from Sock Monkey, and it's all stamped on a big white tag (really just Whisper White cardstock with the edges snipped, and a jumbo eyelet). I had fun watercolouring the truck and everything using my Aqua Painter and ink pads. Because the front flap is shorter than the entire card, I ran a small slip of Early Espresso through the crimper and adhered it so just a sliver of brown showed on the right. Inside the card was a strip of Nursery Suite Specialty Designer Series Paper, which is from the same pack we used for the girly card I showed yesterday. 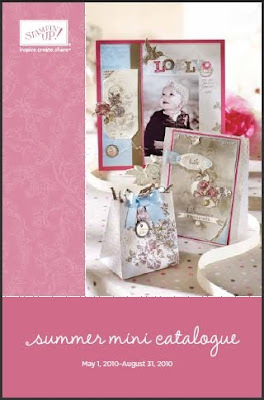 The background is stamped with "Driving by with a birthday hi", which comes from the matching Loads of Love Accessories set. But for the life of me, I can't find the little man's head that I wanted to stamp in the window -- who knows where it's gone to in the abyss of my stamp room disaster!! 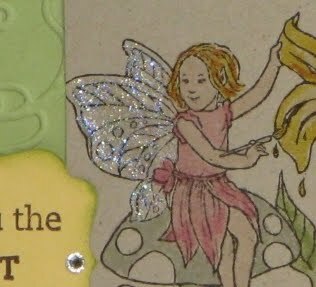 Card #2 features a whimsical fairy from the A Little Big of Magic set in the Summer Mini catalogue. If the card design seems familiar to some of my "Canadians, INK!" team gals from the most recent gathering, that's because I was inspired by Dina's fabulous Just Believe card (a set I don't have yet -- boohoo!). I took her Pear Pizzazz, Crumb Cake & Early Espresso design and ran with it -- thanks for the fab ideas as always, Dina!! That gorgeous background? The new Elegant Lines embossing folder - perfect for cranking through the Big Shot lickety-split. And while you're cranking things through, the itty bitty butterfly floating above the lily was taken from the Beautiful Wings Embosslit die, with an itty bitty little pearl stuck in the centre. With all the watercolouring we did on the last card, this time I just went straight for the markers and layered colours on top of each other. For instance, the dress is a base of Pretty in Pink with some Regal Rose as highlights. And fairy wings would just not be the same without glitter, right? So I didn't bother colouring them and just went straight to the Dazzling Diamonds fine glitter. Stampin' Up! used to carry a really cool holographic embossing powder -- I bet that would have looked just awesome on wings! 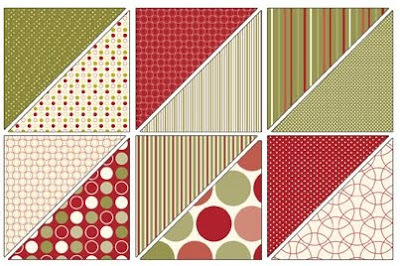 The punches used were the Eyelet border punch and a new punch coming out in the upcoming Holiday mini. I'm just loving it to bits and have been using it all month in my cards and at classes. Nothing wrong with a little fun sneak peek for everyone to play with and see, right? Who wants a FREE Expedited Shipping Upgrade?? Canada, we've been waiting for this and now it's here... EXPEDITED SHIPPING is available on Stampin' Up! orders! Everyone knows the pain of having to wait (patiently?! not always) for orders to arrive from our Salt Lake City distribution centre. But Stampin' Up! recently offered a new expedited shipping option for Canadians for those times when we just can't stand waiting. The price you pay for Expedited FedEx service: for orders up to $650, you would pay the regular shipping charge plus an expedited shipping charge of $25. For orders from $650.01 to $1,300, you would pay the regular shipping charge plus an expedited shipping charge of $50, and so on. But let me share 2 ways you can get this upgrade for FREE! 1) Purchase a Stampin' Up! Starter Kit for only $215 (value of $375+) before the end of August, and you'll receive a FREE UPGRADE to Expedited shipping on ALL your September orders! Click HERE to order yours today... password is Canada. 2) Beginning in September, all monthly Stampers Club & Open Stampers Night orders placed directly with me for pickup at the studio will automatically qualify for the Expedited service upgrade.... absolutely FREE! I'm currently accepting new sign-ups for the September '10 - June '11 Club runs, let me know if you'd like to join us. Please contact me if you'd like more details about either of these great options... I'm here to help! Only 10 days left to order from the Summer Mini Catalogue! Eeek! Where has the time flown this summer??? My kids returned on Thursday after being gone 3 weeks to a fabulous overnight camp, and that means there's just a short time left before September is here and it's back to school time. I was looking at the calendar this morning and realized there's only just over a week left to the Summer Mini Catalogue and then we launch right into the new Holiday one. WOW! So what do I think are some of the MUST HAVES from this mini catalogue? Let me tell you what some of mine and my customers favourites have been so far, so that you can take a peek and still have time to order them before they're gone. Sweet Scoops (set of 8): a fun ice cream themed set complete with hard or soft serve options, your choice of a cake cone or sugar cone, and some tasty toppings. 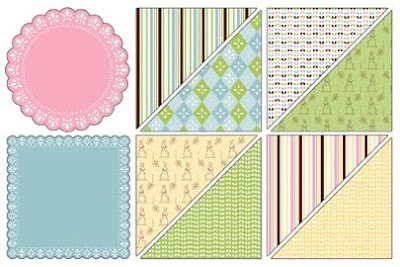 You’ll be able to create a different ice cream delight for each of your projects! Elements of Style (set of 5): Replete with refined images of vintage blooms, birds, and flourishes, this set couldn’t be more aptly named. 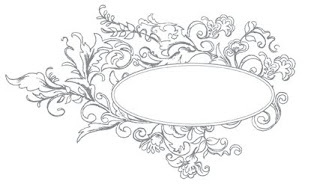 With a little something of everything graceful, you’ll find yourself pulling this set out regularly for an elegant background detail here and a perfect final touch there for many of your projects. 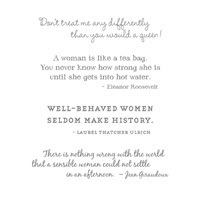 Favorite Thoughts (set of 4): These fun-loving quotes with their playful fonts are versatile enough to use on all kinds of projects — from custom notebooks or a gift of stationery for a beloved friend, to scrapbook pages highlighting the zany personality of a mother or daughter. Blissful Bride (set of 8): This set is the perfect ensemble to commemorate all of the wonderful events that come with a wedding — bridal showers, the family luncheon, and the solemn ceremony itself. It includes everything you need spread the word of a celebration or extend your congratulations to a couple of honour. 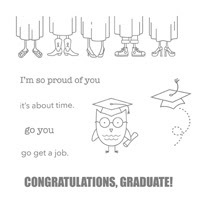 Go, Graduate (set of 8): This set is a reliable staple you can pull out year after year for those graduation greetings that inevitably march along each early summer — all those kindergarden, elementary, high school and college graduates among our family and friends! Sentimental Journey (set of 8): Capture the adventure, romance, and even intrigue of your travels with our trendy distressed and stylized silhouettes in this set. You can also pair these images with our Travel Journal Designer Series paper to give each of your layouts or projects dedicated to your excursions the same fashionable look. Travel Journal Designer Series Paper: It’s said that life is about the journey, not the destination—which is why these papers are ideal for decorating memories of the moments on the way. Island Oasis Designer Series Paper: Transport yourself to a tropic locale with the vivid colours and lively patterns of this paper, which also corresponds with the Tropical Party stamp set and Island Floral Bigz die. So those were just some of the highlights from the mini, but there's lots more to look at inside. If you would like to order from the either the Summer Mini Catalogue or the Big Book -- just drop me an email, call or stop by, or shop online from home! One last Christmas card to share... for now! I'll share one more card from my Holiday cards class this week before we move on to new things... how does that sound? I knew even before I started this card that I wanted to incorporate the new Jolly Holiday designer paper in it. The colour combination I'd be working with was Cherry Cobbler, Old Olive and Very Vanilla, with the lighter Pear Pizzazz as an added colour. The card size isn't your usual 1/4 sheet folded card...instead, it's a 6 1/4 x 3 1/4" long card, which fits perfectly in our Open End envelopes. Now, I've always loved using sponge daubers and a punch "mask" to create fun shapes and images. It's one of those easy techniques to use if you don't have a stamp in the shape you want! In this particular instance, I first stamped a snowflake from the Snow Swirled set in Cherry Cobbler ink at the bottom of the Very Vanilla cardstock piece. I then overlayed the mask I had made using the Ornament Punch, and gently sponged into the shape some Pear Pizzazz ink. Pierce 2 holes around the "neck" of the ornament, tie off some silver cord and then add a small Rhinestone Jewel in the middle -- all done!